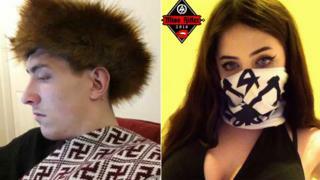 A "Miss Hitler" contest entrant accused of being a neo-Nazi terrorist discussed with her boyfriend becoming a martyr, a court heard. Alice Cutter, who is accused of being a member of banned group National Action, was texting Mark Jones the day after Valentine's Day 2017. She was said to have text: "I'm not really keen on becoming a martyr and leaving kids behind or having them suffer too." The pair deny being part of the group. At Birmingham Crown Court, jurors heard of an exchange that picked up the thread of a conversation the couple, of Mulhalls Mill, Sowerby Bridge, near Halifax, had been having on 14 February. In texts sent the following day, Ms Cutter, aged 22, told 24-year-old Jones: "Can't think of anybody better to attempt to carve out an existence with." Mr Jones replied: "Ride the tiger. Don't over think it, as their whole world view is self-defeating in the end." Ms Cutter said she did not want to be a martyr, the court heard, adding: "But they [their children] will suffer anyway, if we don't do this. "And I see being childless as a non-option. "I fear what's coming for all our sakes, but it's no good thinking like this." His girlfriend had entered a "Miss Hitler" pageant under the name "Buchenwald Princess" referencing the infamous Nazi concentration camp, jurors heard.